Looking for expert advice on choosing handbags? Look no further! Celebrity style and image consultant Sam Saboura, style host of ABC's popular Extreme Makeover offers incredible, down-to-earth advice to keep you looking your best. In addition to his style tips for LoveToKnow readers, Sam also answers questions about his career, his inspirations, and his best-selling book. LoveToKnow (LTK): Sam, you have an incredible background, including your work as style host for Extreme Makeover, upcoming work on Rachael Ray and The Golden Globes, a style column in L.A. Confidential, working on a new book and the launch of your own women's clothing line. What inspired you to develop a career in style, fashion, and image consultation? Sam Saboura (SS): For as long as I can remember, I've always had a passion for art, great design and style in general. My mom has excellent taste and was involved in the fashion industry, so growing up I was always surrounded by great clothes and creative people. I used to sketch women's clothing as a child, makeover my friends and family members and shop for sport. I channeled my passion into a career in retail. Throughout my teens and twenties, I had the opportunity to play dress up with thousands of different people, from all walks of life. I learned so much from working hands on and experimenting with my clients. What I do today has been in my bones for years, and seems totally natural to me. Ironically, I'm great at shopping for others and making style decisions without hesitation, but I hate shopping for myself. LTK: Let's talk about your book, Real Style: Style Secrets for Real Women with Real Bodies. What prompted you to write the book? SS: Actually, It was all very matter of fact. I would've never thought in a thousand years I would publish a book. My manager and I were having a meeting and he said to me, "You should write up some ideas for a book." I had been getting tons of emails from viewers of EXM (Extreme Makeover) saying they wished that I would write a book, they wanted an outlet where they could get all the style advice they enjoyed from the show. I sat down at my computer and typed up a very long, very detailed outline. I had a lot of fun doing it and have always secretly loved writing. We sent a copy to a literary agent in NY, he loved it and sent it out to a bunch of publishers, and the rest is history. Basically I wanted to write a no nonsense style book that was not intimidating or judgmental, one that appealed to my audience of real women who needed a voice and some help. I hope that's what women get from the book. I think it's a lot of fun and very informative, the ABC's of style. LTK: You also designed My Real Style Makeover Journal, which goes along with your book. How is this an effective tool for achieving your personal style? SS: It is a scrapbook for style, a journal where you can build your own storyboard of visual images and notes. There's space for magazine clippings, pockets for swatches and whole sections for lists and organizing. It's a cool way to take stock of what you own, what you need to buy and what inspires you. I also think it's amazing for younger girls who are into fashion and style. It's a great tool for expression and makes for a fun ongoing project that can really help improve your style. It ends up being your own style diary, totally personal and full of awesome information. The oversized hand bag is a must have. LTK: While many women are concerned with finding the right clothing styles and fashions for their body types (a topic covered in depth in your book), many of us don't extend that concern in regards to our accessories and handbags. Given your style expertise, would you say that different body types look better with different styles and sizes of handbags? SS: Absolutely. Choosing the right bag for your body is just as important as getting the right fit in your clothing, but very few people realize that. Whether you know it or not, the bags you love and carry the most, should compliment more than just your outfits, they should flatter your body type. That is, unless you're buying a bag because it's trendy, which is a whole other story. For example, this season the oversized bag is a must have, so sometimes we break the rules to carry the bag of the moment, but for the most part, your bag should always balance the proportions of your body. Choosing your bags based on their relationship to your shape and size is key. 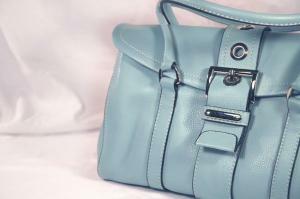 LTK: Does handbag color come into play at all in making handbag choices that are right for your body type? SS: I always suggest sticking to basic tones that will give you the most mileage within your wardrobe, unless you have the means, and then you can go for broke with colors, textures, and patterns. Accessories should be fun and make a statement, expressing your own sense of style and individuality. Your outfit will dictate the color of your bag more than your body type. But if you're concerned with how your bag compliments your frame, then colors will make a difference. I find that most women will carry a favorite bag regardless of its effect on her body. If you're dressed monochromatically, for example, a bag in a striking color with interrupt your bodyline. Depending on where the bag sits on your body, the color you choose can make you look longer, shorter or heavier. In the same way tonal dressing helps to elongate the body, matching your bag to your outfit will eliminate distraction and create a better flow. LTK: Are there any handbag types that work well for most body types? 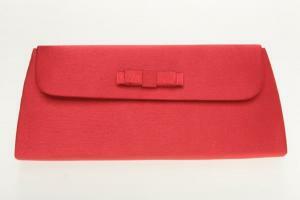 SS: The clutch tends to compliment most shapes with its simple, clean lines. It's my "go to bag" for a chic, finished look. It can be carried in the hand, around the wrist, or under the arm. Most are flat and long so they don't complicate the bodyline. You can choose to make it a focal point, or tuck it away, out of sight. Soft, deconstructed shoulder bags work well too, because they collapse and mold to the body, which can limit the appearance of added bulk and volume. Known for his savvy, but practical advice for real women, Sam has generously given LoveToKnow readers a great handbag guide on choosing bags to fit your particular body type. Smaller styles are best, with shorter straps or handles. Choose a bag with minimal hardware and flash. When the body is petite, you need to keep your accessories clean, simple, and tonal to your outfits. Your bag should not compete with your small frame. Most styles will flatter your figure. You're the coat hanger of the body types, so you wear accessories well. But keep in mind that a super-sized bag will only play up your lankiness and small delicate bags will get lost on you. Long shoulder bags, bucket bags, and hobos are all winners. And bags with bold patterns and details will also play well against your model height. Carry a bag that has some volume and size to keep things in proportion with your silhouette. Keep your outfits simple and let your bag do the talking. Smaller pochette bags carried under your arm will only play up your fullness. Make sure the bag sits above or below the fullest part of your body not on it. Try and keep your bag away from your body if possible by carrying it in your hand, in the bend of your arm, or dropped low at your knees. The bag you carry should stop below your bust or above your hips, never at them. This will help you avoid extra padding where you don't need it. Try a stiff bag with structure to contrast and balance your curves. You should have an easy time choosing the size, shape and style of the bag you'll carry, since most will flatter. Keep things in the middle just like your body. Avoid extremes, large and small, and you should be fine. LTK: Are there any other tips you'd like to add for choosing handbags? SS: In the end, always buy what you love; when you're confident about something you wear it makes all the rules null and void. A great bag is an extension of your style, and one of the best ways to express your personality when you get dressed. The right bag may even find you when you're not looking so go shopping and have fun! LTK: What is the most satisfying aspect of your career? SS: There are a lot. I love that moment when the light bulb goes on and a client finally realizes that they've found their style. Most of the time, I'm just playing the Pied Piper and helping them find their own potential. I get to help boost people's self esteem and make them feel good. At the end of the day, it's amazing to know that I've helped to change someone's life-that's huge. How may people are able to say that about their job? And like anyone, I love to see the "after" in a before and after, that never gets old…. After graduating with honors from the University of Iowa with a double major in Theatre and Communications, Sam worked as the personal shopper at Fred Segal in Los Angeles. During his time there, he outfitted many celebrities, including stars Jennifer Aniston and Sarah Jessica parker. In addition to work on Extreme Makeover, Sam contributes regularly to Good Morning America, The Tyra Banks Show, E! Entertainment, MSNBC, and CNN. He has also provided fashion commentary for The Oscar awards, The Emmys, and The American Music Awards. You can also find contributions and style tips from Sam in top fashion magazines including Cosmo, Redbook, and Glamour. Sam Saboura's Real Style: Style Secrets for Real Women with Real Bodies and the accompanying Real Style Makeover Journal are sold online and in many bookstores, including Amazon.com.